Cultural production should indeed be a "socially and politically communicative, transgressive, or critical activity." It requires professionalism of the highest level. 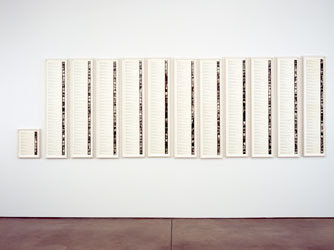 Haacke's most recent show was at Paula Cooper at the beginning of this year. It featured some recent work and one of his best older pieces, Sol Goldman and Alex DiLorenzo Manhattan Real Estate Holdings, which looks more terrifyingly prescient each day and lives up to the polemic he wrote for October. The New York Times is reporting today that Tishman Speyer has been using a private investigations service and three law firms to find residents in Stuyvesant Town, who are breaking the terms of their rent-stabilized leases, falsely accusing a large percentage of them in the process. In effect, they're reversing the direction of the research that Hans Haacke completed on Manhattan real estate in the 1970's - which famously led him into a showdown with the Guggenheim in 1971 (of which Sol Goldman... is a part). Tishman Speyer's behavior in Stuyvesant Town is, of course, just one part of a much larger picture, and - I'm more pessimistic than Haacke (and Chomsky, apparently) - it's troubling to survey the lack of any sort of critical resistance within the American (or international) academy or art world on foreign and domestic issues in this election year.